A classic Ford tractor will bring memories of a simpler time when life on the family farm was an American tradition. Although those days are gone for many, the memories can live on if you acquire a vintage farm tractor. The Ford 4000 tractor has a rich history, making it an excellent choice for collectors and amateur agriculturists alike. The Ford 4000 tractor was produced between 1965 and 1975. They were built at Ford's production facility in Highland Park, Mich., and were designed for agricultural use. These were four-cylinder gasoline or diesel-powered models, and should not be confused with the three-cylinder models that Ford also began producing in 1965. The Ford 4000 tractor was the second one in the thousand series of tractors to be introduced. It was slightly larger than its predecessor, the Ford 2000 and slightly smaller than the next model, the Ford 6000. Both the Ford 2000 and the Ford 4000 tractors were marketed as replacements for the Ford 601 and 801 models, which were produced through 1963. The Ford 4000 tractor signified a change in the look of the Ford tractor. Early models of this machine were painted blue and white, rather than the red or red and cream color of previous Ford tractors. Later, the Ford 4000 was painted entirely blue, and this became standard for later models such as the Ford 6000. Ford built about 300,000 of these tractors. About 24,000 were produced in 1965, the fewest built in a single year. The highest number of tractors produced in one year occurred in the final year of production. In 1975, about 45,000 tractors were built. 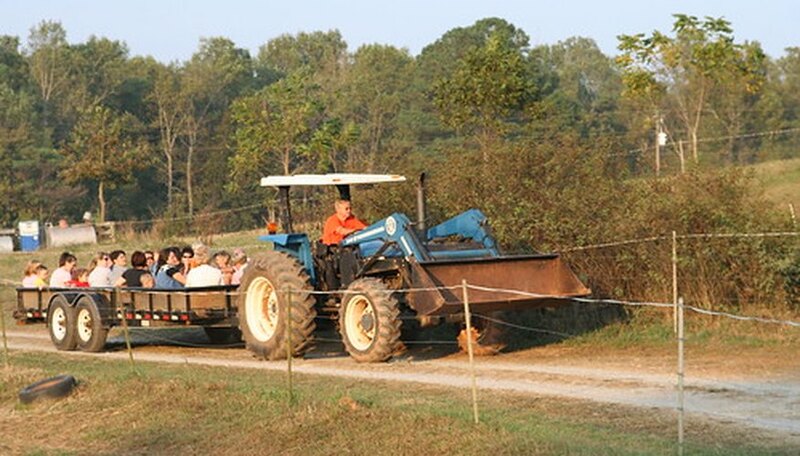 The Ford 4000 tractor weighed about 4,660 pounds. It had an eight-speed transmission and could reach a maximum speed of 16.8 mph. The tractor had a 16-gallon fuel tank and required eight quarts of oil. Standard equipment on the tractor included a tachometer, oil-pressure warning light, generator warning light, water temperature gauge, headlights, taillights and instrument panel lights. It also had a deluxe seat, vertical exhaust, swinging draw bar, fenders and a tool box. Those who bought the Ford 4000 tractor from the dealership could choose from a wide array of options. These included power steering, horizontal exhaust, power-adjusted rear wheels and diesel-engine cold start. Buyers could also purchase a differential lock for the wheels. This would distribute power evenly to both wheels, giving the tractor more traction when operating in difficult areas.